Today, at high noon my time, was the first High Noon Radio Show on DS106 radio. We appreciate more than a sack of corn, for our Chief Radio Guru Grant Potter who was a workin’ late into the wee hours rebuildin’ the radio station on a brand new server. I got ready by first makin’ a radio show intro, editin’ from some YouTube talkin movies about what some folks think is the greatest western movee– High Noon. Since its been a few yarns since I’ve been on the radio, I did all the set up and testin’ the sound for the Rube Goldberg DS106 Radio Setup described by Alan Levine. That is I did everything but the crucial test. Then I had all kinds of dust thrown in my face by Skype trying to dial in Paul Bond. But Mariana Funes and me were ready, and we started promptly with grand style for 10 minutes. Yikes, I thought from my side we were broadcastin’ but nothing was goin’ out on the waves. I was checkin’ the settin’s. People where hearing stuff thats not me. Grant Potter responded quickly and was offerin’ suggestions. I finally wondered if was my Ladiocast Crystal set, so I restrung the wires to use Nice Cast, and then we was heard. High Noon Radio happening now https://t.co/RduoaCpaOx #ds106 #ds106radio I think I can hear the campfire crackling in the background. We had a free wheeling discussion and she held the conversation goin’ when the Gila County Sheriff really knocked on my door. Listening in to #ds106radio https://t.co/pn58TwgvOQ #western106 hoping to get my blog into the posse in the next day or two..
And it is now set to be replayed at Thursday, Saturday, Tuesday ‘n Wednesday on DS106 radio at high noon Pacific time along with other western stuff. Tune into DS106 radio via http://ds106rad.io/listen. Look for our show next week with guests Ken Buaer and Jim Groom and my mule named Bob. There will likely be futzing. Top / Featured Image Credit: Public domain image from Wikmedia Commons – a fascinating find. 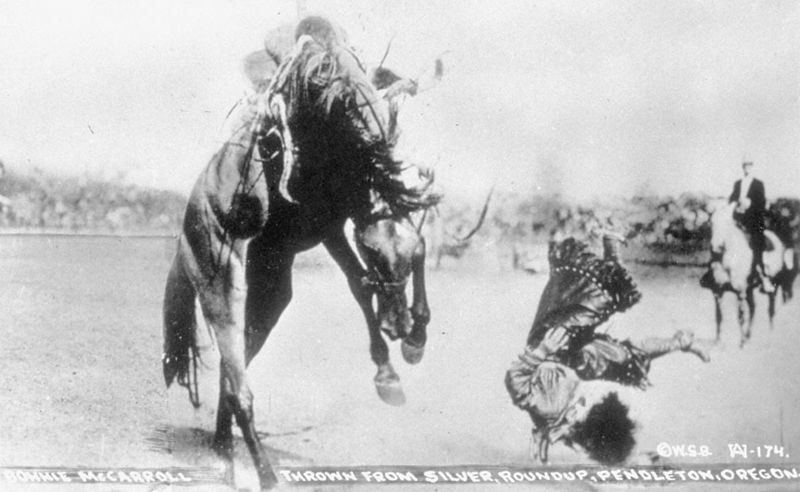 This 1915 photo is of bronco rider Bonnie McCaroll being thrown from a horse named Silver at the Pendleton Round-Up. This long running rodeo is held in north east Oregon. McCarol died from being tossed by another horse at this rodeo in 1929.